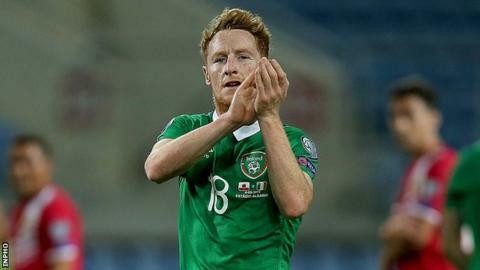 Stephen Quinn will miss the Republic of Ireland's Euro 2016 play-off matches against Bosnia & Herzegovina on 13 and 16 November because of a knee injury. The Reading midfielder was not included in Republic manager Martin O'Neill's provisional 39-man squad for the games. The squad will be trimmed ahead of the group meeting on 9 November. Uncapped trio Alan Judge, Eunan O'Kane and Adam Rooney are included, as is Stoke City striker Jon Walters, who is suspended for the first game. The Republic will travel to Zenica for the first leg on Friday, November 13, with the second leg at Dublin's Aviva Stadium three days later. Speaking at a press conference on Wednesday, O'Neill said: "After finishing third in a difficult qualifying group, we enter into the play-offs against a very good team in Bosnia & Herzegovina. "Our fate is in our own hands and we will be doing all that we can to qualify for next summer's finals. "We will play the second leg at the Aviva Stadium and that is a big plus for us because the Irish supporters were fantastic in our last game there against Germany and we know that there will be a similar atmosphere for this play-off." The Republic finished third in their qualifying group, four points behind world champions Germany and three points adrift of second-placed Poland, who beat them 2-1 in the final Group D fixture this month. In the three other play-off matches, Ukraine play Slovenia, Sweden face Denmark, while Norway take on Hungary. Bosnia finished third in Group B behind Belgium and Wales, drawing 0-0 against Chris Coleman's side in Cardiff before winning 2-0 at home. The Republic's only previous meeting with Bosnia was a 1-0 friendly win in 2012, when Shane Long scored the decisive goal. Long faces a race to be fit for the play-off, having suffered injured ankle ligaments in the defeat by Poland. The Republic reached Euro 2012 via the play-offs, with the side then managed by Giovanni Trapattoni beating Estonia 5-1 over two legs. Goalkeepers: David Forde (Millwall), Shay Given (Stoke City), Keiren Westwood (Sheffield Wednesday), Darren Randolph (West Ham United), Rob Elliot (Newcastle United). Defenders: Richard Keogh (Derby County), Marc Wilson (Stoke City), Seamus Coleman (Everton), Cyrus Christie (Derby County), John O'Shea (Sunderland), Alex Pearce (Derby County), Shane Duffy (Blackburn Rovers), Ciaran Clark (Aston Villa), Paul McShane (Reading), Stephen Ward (Burnley), Greg Cunningham (Preston North End). Midfielders: Robbie Brady (Norwich City), James McCarthy (Everton), Jeff Hendrick (Derby County), Darron Gibson (Everton), Harry Arter (Bournemouth), Eunan O'Kane (Bournemouth), Glenn Whelan (Stoke City), Paul Green (Rotherham United), Aiden McGeady (Everton), James McClean (West Bromwich Albion), Alan Judge (Brentford), Anthony Pilkington (Cardiff City), David Meyler (Hull City), Jonathan Walters (Stoke City), Wes Hoolahan (Norwich City). Forwards: Robbie Keane (LA Galaxy), Shane Long (Southampton), Daryl Murphy (Ipswich Town), Kevin Doyle (Colorado Rapids), Anthony Stokes (Celtic), David McGoldrick (Ipswich Town), Adam Rooney (Aberdeen), Simon Cox (Bristol City).